Aerowing patented Rapid Curing technology provides quick curing of sealants, paints and adhesives. Optimized energy transfer reduces cure times by a factor of 10 to 20. Our process works at low temperatures, and can be certified safe to operate inside fuel tanks or other hazardous areas . This process does not change the molecular properties of the material. By emitting a special low temperature infra-red signal to the materials, Aerowing Rapid Curing Device (RCD) reduces cure times by more than half. The touch-screen control paneldisplays information in real time, which allows easy automation of the curing process. 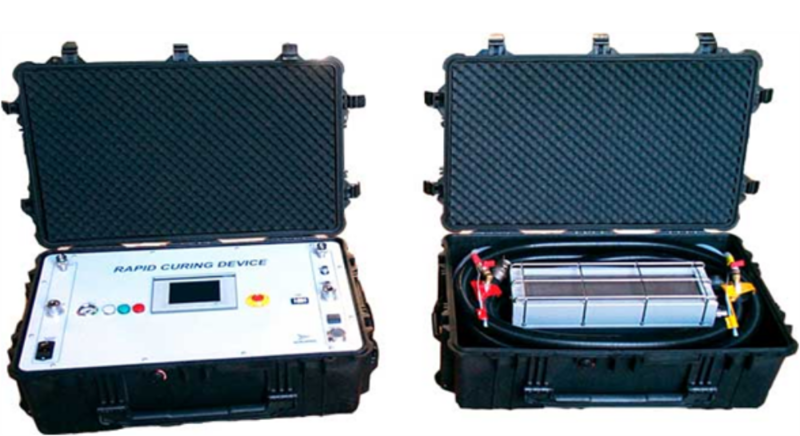 The low temparature emitter is a 28 Vdc Emitter, is Class 1 Div 1 safety certified to be used inside aircraft fuel tanks. This can be especially useful during AOG situations. The RCD is the only compact low temperature 28 Vdc emitter system on the market. For an idea of the reliability and time savings that can be achieved by switching from ambient cure to Aerowing Rapid Cure check out our Tested Sealant Chart. 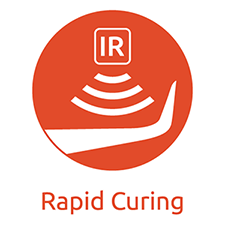 Aerowing Electronic Rapid Curing Device (eRCD) was developed as a simple solution to expedite sealant cures for aircraft production lines and MRO shops. The eRCD can be delivered with a control panel, small emitter and holder for small jobs like patch repairs or with a configuration of multiple size emitters to accomplish windshield installation and wing seam cures. The Aerowing design team is on stand-by to help design a rapid curing system custom fit for your needs.